Fantastic musical craft from contributing writer Kim Young! I can’t wait to do this with my little guy . 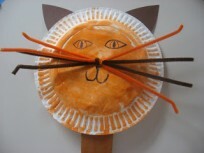 This craft is a fun way to teach young children about sound. 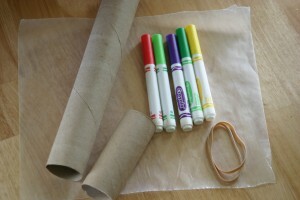 All you will need are toilet and/or paper towel rolls, markers, wax paper, rubber bands, and scissors. 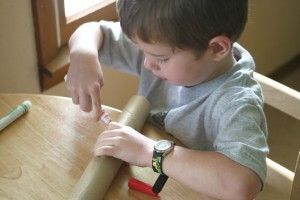 Have your child decorate the roll however they would like. 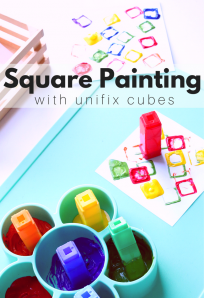 You can use crayons, markers, glue and glitter, or stickers. Whatever you have available will work great. Cut the wax paper into 3 inch squares, place over one end of the roll, and secure with a rubber band. Now have your child blow or hum into the roll. You will know you are doing it properly when you hear the loud vibrations from the wax paper. 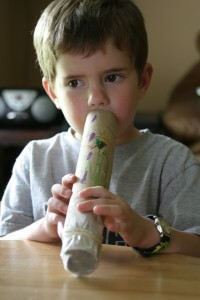 We talked about how the air carried the sound from our mouths, into the tube, and then to the wax paper. The sound became vibrations again. When my son questioned the “again” part, I turned on music and sat him on the subwoofer to the surround sound system. He instantly got the vibration part of sound. This craft was a fun way to show the scientific side of music to my son. He mostly just enjoyed his new instrument. My daughter (only 20 months) really enjoyed making music in these as well. 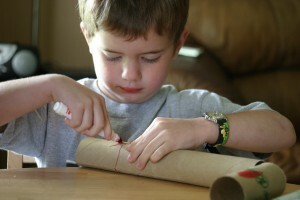 This craft was not messy, very fast, and provided the kids with hours of enjoyment playing music. Perfect for a quick craft or a craft at someone else”™s house. What fun! I bet he loves to play it. We are making this today! She was just playing with a paper towel roll and putting things in it and using it as a sword. .-= Janna @ The Adventure of Motherhood´s last blog ..Making Time for Children: All of Me, Part of Me, None of Me =-. 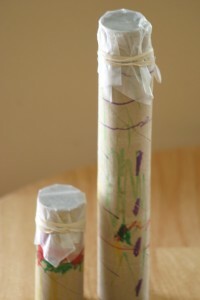 Love this idea and love your blog, but want to caution folks to avoid using toilet paper rolls for crafts. Lots of nasty germs (e. coli, shigella, etc)that are easily spread! If people are concerned about the toilet paper rolls. Put them in the microwave for 45-60 seconds and all the germs should be killed. Thanks for this idea, my 4th grader need a instrument for her school project.